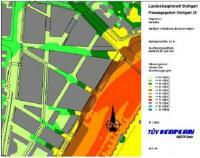 Noise immission plans were established in the context of the analyses for Stuttgart 21 for an area of about 12 km² covering the plan area (POOK et al., 1997). Prognostic calculations for the predicted state have not been finished yet (POOK et al., 1999). The area under consideration is a settlement area which is crossed by heavily frequented roads and railway tracks. This why high traffic noise immissions have to be expected. 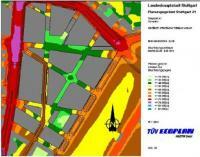 An excerpt from the noise immission plan for roads between 10 pm and 6 am is given as an example in figure 8-1. You can see in this figure that the immission limit value of 49 dB(A) for residential areas is exceeded at numerous places. Figure 8-2 shows an excerpt from the noise immission plan for railway traffic between 10 pm and 6 am. This figure also illustrates that the immission limit values for residential areas are exceeded in large parts. The source of essential immissions is the holding sidings and railway depot. The areas where limit values are exceeded are bigger during the night than during the day.